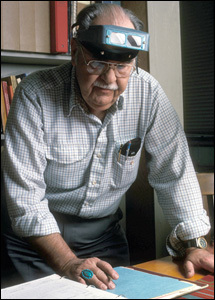 Joe Ben Wheat was Curator of Anthropology at the University of Colorado Museum from 1953 until his retirement in 1987. Dr. Wheat had a deep interest in the textile traditions of the Navajo, Pueblo and Hispanic Southwest. 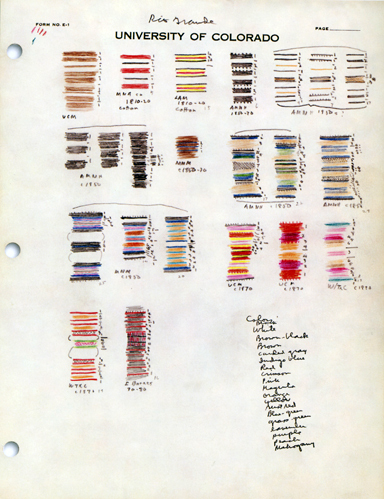 In 1972 he began his "Textile Survey," a systematic study of Southwestern blankets, mantas, kilts, belts, rugs, and other weavings. He continued the study until his death in 1997. Wheat searched for old, outstanding weavings with histories - documents that told when and where they were woven, who wove them, and who used and owned them. He examined over 3,500 of the finest pieces from museums and private collections, and selected about 2,000 for detailed analysis. Many were accompanied by bills-of-sale, letters, or other documents telling their stories. By using well-documented rugs and blankets, Wheat reconstructed the history of textiles, and "wrote the book" on southwestern weaving. When Wheat arrived at the University of Colorado in 1954, there were only a few Southwestern textiles at the Museum. Today, the Joe Ben Wheat Textile Collection totals about 850 rugs, blankets, kilts, sashes and other weavings from the late 1700s up to the present - one of the most important collections of southwestern weaving in the world. Textiles - both historic and modern - are added to the collection through donation or purchase. 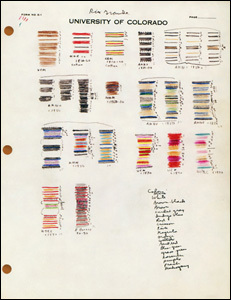 After completing Southwestern "Textile Survey," Wheat began to build a collection for the University of Colorado Museum. He sought historically important weavings: pieces that showed different techniques, innovations in designs, and other turning points in Southwestern weaving. Wheat assembled a collection of outstanding textiles representing all styles of southwestern weaving. Equally important, many of the pieces had excellent historical documentation - letters, receipts, and other papers. The Joe Ben Wheat Textile Collection is one of the most important collections of Southwestern weaving in the world. Many pieces are over one hundred years old. The collection represents the enduring traditions of Navajo, Pueblo and Hispanic looms - and Wheat's remarkable research on the history of southwestern weaving. The collection has outgrown its storage space. Textiles are stacked floor to ceiling, and many of the oldest, most important pieces are folded into drawers. (Folding creases the textile and, ultimately, may break the threads.) Existing environmental controls allow temperature and humidity to vary beyond acceptable limits for textile conservation.